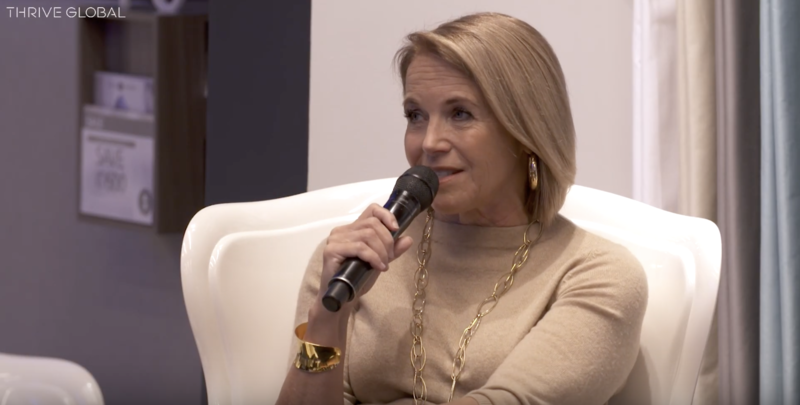 On the Thrive Global Podcast, Katie Couric opens up to Arianna Huffington about coping with negative self-talk and silencing her inner critic. Katie Couric always seems confident. Even before becoming a New York Times best-selling author and co-founding her organization Stand Up To Cancer, the award-winning journalist made a name for herself in with her charismatic on-screen presence — and her self-assured nature has captivated audiences everywhere. But talking to Arianna Huffington on the Thrive Global Podcast, in partnership with iHeartRadio and Sleep Number, Couric explains that her confidence is not always as natural as it looks. The negative self-talk Couric is referring to is what Huffington calls the “obnoxious roommate living in our heads,” often intruding our thoughts, telling us that we’re just not good enough. “That negative self-talk… is so destructive,” Huffington says, highlighting the importance of learning from those who lift you up instead of put you down. “I love it when our daughters are basically feeding back to us what we’ve taught them,” she adds.